"The distribution of sites, too, provide clues to the seal inscriptions. In Dravidian-speaking South India today, the name of the ancestral village often forms the first element of a person's proper name. Such a place-name, of course, serves the purpose of interregional identification. It is not impossible that place-names were used for this purpose in the Indus seals. Minoan-Mycenaean place-names surviving to historical times played a central role in the decipherment of Linear B. A similar survival of Harappan place-names in the Greater Indus Valley is not at all unlikely. But how can potential place-names in Indus inscriptions be isolated? A fundamental condition is that the sign or sign sequence suspected to represent a toponym should be peculiar to inscriptions from a single place. The likelihood that a sign known from one site only represents the ancient name of that site increases with the frequency of the sign. As toponyms can hardly be expected to be a regular component of all seal inscriptions, they should stand out from the more usual contents and be placed at either the beginning or end of the text, perhaps even more clearly apart from other signs. 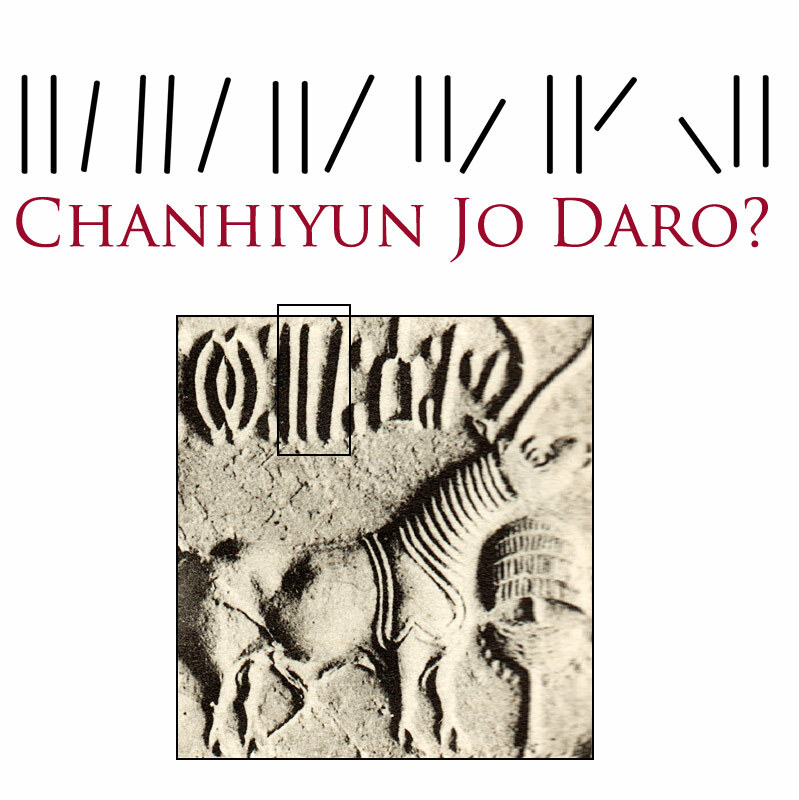 "According to a resident of the little village of Jamal-Kirio, who is a Professor at the Sindh College, Karachi, the name Chanhu-daro," wrote Ernest Mackay, who led the first excavations here in 1935-36, "is derived from the names of two sisters, Chanhiyun and Bohiyun, of whom nothing else is known; daro in Sindhi means a "place." Which mound is Chanhiyun and which Bohiyun I was unable to ascertain, and these names are probaby much older than their Sindhi equivalents. There is no fixed tradition in the neighbourhood as to the origin of the mounds, but a great black snake, said to have been many yards long, is associated with them in village legend. It is quite possible that this serpent was simply a king cobra maginified by tradition, for snakes are quite commonly found among the ancient mounds of Sindh. In the course of our excavations we came across several snakes, off of normal size, hibernating deep in the ruins." (Ernest Mackary, Chanhu-daro Excavations (1935-1936), p. V). Although this may be entirely coincidental, the sign does convey something two-fold or double. The font above in black is taken from the Indus Script Corpus Compiled by Asko Parpola, digitized and offered as font packages for free by the National Fund for Mohenjodaro in Karachi, Pakistan.